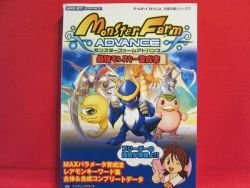 Title :Monster Rancher Advance complete strategy guide book / GBA Language : Japanese. This is an official book. Release Date : 2002 Total Pages : 255 pages Platform: GAME BOY ADVANCE, GBA Condition : USED. Very Good. No missing page. Description:This is a Japanese Videogame "Monster Rancher Advance" strategy guide book. The strategy and data, etc. are very comprehensible.Even if the platform is different, the content might be almost the same.